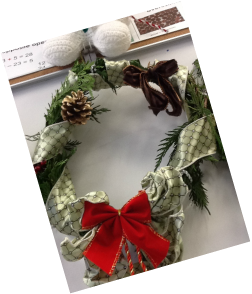 This is my holiday wreath we had to put tree branches on a cote hanger and we had to shape it into a circle then we put wire to hold the branches then all we did is decorate it. I could have made my wreath a little more bushy and neater. I think I made it very decretive by putting a lot of decorations on it. Also, I think it looks nice because I put the ribbon on. What I learned while I was creating the 3D ball ornament is that it is hard not to pop the balloon when you are blowing it up you need to put on enough string to get good structure so the ball stays intact when you pop the balloon. I think I could have put more string on and made it in a pattern. I think I did the shape of the balloon good and the gluing. I learned how the borax forms in into crystals firstly, we made a shape out of pipe cleaner than we put it into a cup and tided a string to it and also, tided it to a pencil to hole it in the cup. Secondly, we pored boiling water in and than put 3 tbs of borax in there. Lastly, we let it sit over night. 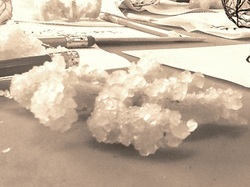 The crystals form because of the hot water makes the borax dissolve and as it cools down to room temperature it sticks to the pipe cleaner or anything that it can stick to. I think I could have made it a better shape and I could have changed the color. I think I did the tying good and the I added the right amount of borax. This is my Onomatopoeia pop art and we could only use the colors black, white, yellow, blue, red I learned how I can make words pop more so it catches the viewer or audience. As you can see in the picture I have only used those colors and I have made the words pop also, I learned how to draw a little better. Next time I create it I could have made it look a little neater and maybe add more detail. I colored it deeply which I think I did good on and also I think the design is pretty good.